As the pads have a 2.0 mm spacing, I used a short piece of ribbon cable with the typical 2.54 mm pin header at the other end. The RK3399 UART uses 1.5 Mbps instead of the common 115.2 kbps. The RK3399 has a fixed boot order – SPI, eMMC, SD card. So to force the RK3399 to boot anything different than the Android firmware on the internal, soldered eMMC flash, one has to „disable“ the eMMC. 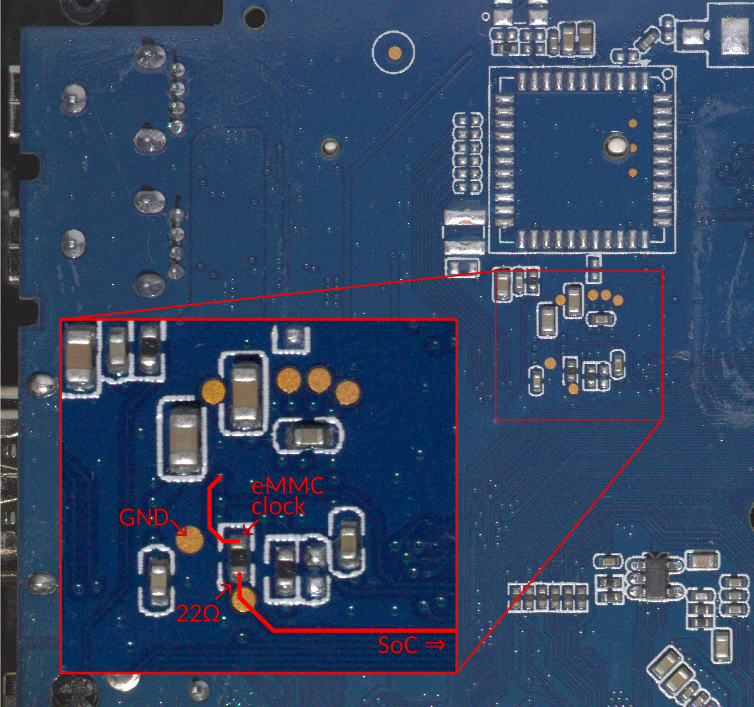 The canonical method for doing so on any Rockchip board is to short the eMMC clock line to ground. As the bootrom code can no longer detect any usable boot code on the eMMC it will try the SD card next and will finally fall back the so called MaskRom mode. 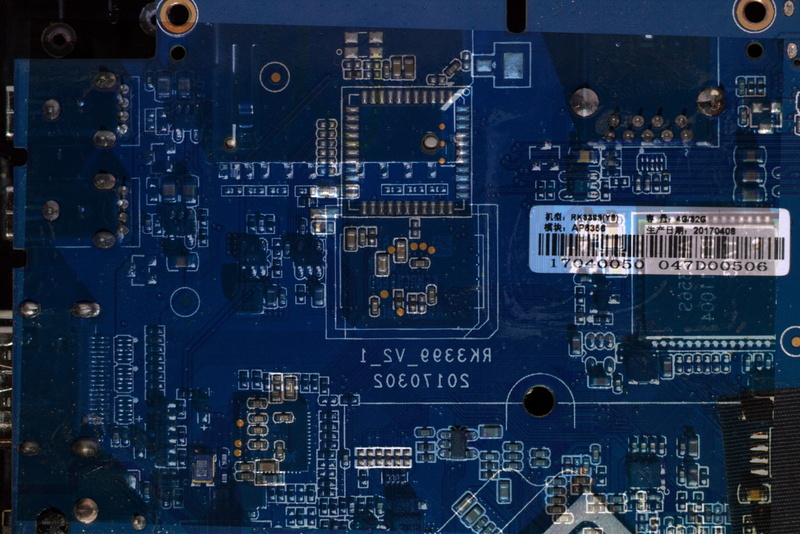 The MaskRom code provides access to the SoC via USB, allowing to bootstrap the device. 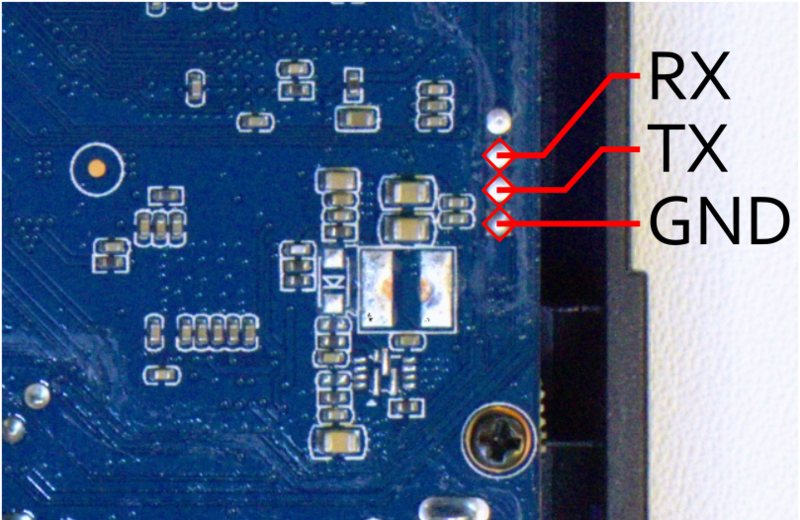 From the datasheet of the Samsung KLMBG4WEBD-B031 eMMC flash it became apparent the clock had to be on the left side of the board. Using my scope I measured the signals available on the different test points, et voilà, found a steady 200 MHz signal. Another give away was the 22 Ω resistor on this signal, which can also be found in the Firefly-RK3399 schematics. The series resistor is somewhat odd, as a series resistor for signal conditioning should normally be located near the driver (i.e. the SoC). Anyway, it makes a nice spot to force the clock signal to ground. When pressing the Power button to start the Y8, normally the red LED lights up for one to two seconds and then becomes blue. When the eMMC clock is shorted, the LED will stay red, and the device is in MaskRom mode. The Y8 can be connected to a USB host using a USB Type-C to Type-A cable, and it will show up with the RK3399 specific Vendor/Product ID 2207:330C. For some tasks like compiling and QA tests I was looking for some more powerful additions to my SBC collection of RPI3 and Allwinner Pine64. Requirements: Aarch64, plenty of RAM, fast CPU, fast network, mainline kernel support (in a not to distant future). There are more expensive options like the LeMaker HiKey 960 (240€, 3 GByte RAM, still no ethernet), or the Firefly RK3399 (200€, 4 GByte RAM), but these where clearly out of the 100€ price range. The SBC board all sport a considerable number of of GPIOs, SPI and I2C ports and the like, but for hardware connectivity I already have the above mentioned bunch of RPIs (1 and 3) and Pine64 boards. So going into a slightly different direction, I investigated some current settop boxes. Contrary to the above mentioned Firefly, you neither get PCIe expansion ports nor any GPIOs, so if this is a requirement the Y8 is no option for you. In the next part, I will give some more details useful for running stock Linux instead of the provided Android 6.0 on the device – so stay tuned for UART info, MaskRom mode etc. As long as one sticks to printing PLA, a printer without heatbed is ok, but for ABS or PETG a heatbed is a must. The TinyBoy2 is a Indiegogo backed 3d printer. On the plus side, it is very small (16×18 cm² desk space), and it does it jobs. Like a lot of crowd funded projects, there is essentially no after campaign support. The firmware is a hacked version of Marlin 1.1.0-RC3. The code for the firmware which is shipped with the hardware is supplied as a code drop, but there is no changelog, and the diff to the upstream RC3 contains a lot of awkward changes, e.g. changes to the display SPI code, although the TB2 display uses I₂C. The diff between the code drop and RC3 is 53 files changed, 2196 lines removed, 2072 lines added. As I wanted to update my printer to a recent firmware (RC3 was tagged December 2015) to get all the new features and bugfixes, and also to change the FW behaviour, I started with the current Marlin GIT, and added the necessary changes on top. The nice part is that current Marlin is completely capable to drive the printer, support is mostly added by creating a suitable Configuration and setting the right pins for steppers, PWM, encoder and so on. The changes have been submitted upstream, or you can just pull the patched tree from my Marlin github repo. As DVB-T(1) is phased out in Germany soon, I got me a new DVB-T2 stick. The MyGica T230 is supported under Linux, and has a quite low price (~20€). Instead of the expected T230, I received a T230C which has silently replaced the T230. The T230C is – although quite similar to the T230 – currently (Linux 4.10rc2) not supported by the mainline kernel. Compared to the T230, the T230C uses the same Cypress FX2 CY7C68013A USB bridge chip, a Silabs Si2168-D60 demodulator (new revision) and a new tuner chip, Silabs Si2141-A10 (T230 uses a Si2157). Beyond the bridge/RF chips, there is an I2C eeprom (FX2 firmware? ), two LowPowerSemi adjustable, synchronous DC/DC buck converters (marking LPS A36j1, LP3202? ), a 74ACT1G00 NAND gate (marking A00), two 24MHz oscillators and a bunch of passives. The ESP8266 lacks any hardware support for PWM. Any ATtiny, PIC or any ARM Cortex M0 based SoC fares better in this regard, although the smallest SoCs may have only one or two channels. Set the duty for a logical channel. One duty unit corresponds to 40ns. The maximum should be period / 40ns, but due to the implementation there is a fixed dead time of 100μs which limits the maximum duty to 90% when using a period of 1ms (i.e. a frequency of 1kHz). 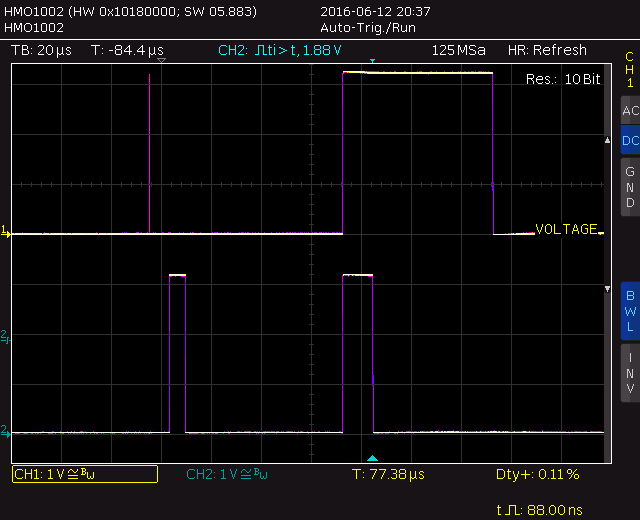 Set the PWM period to period microseconds. Needs to be called before any pwm_set_duty, pwm_set_period calls take any effect. Does some preparatory work needed for the interupts handler to do its job of toggling the GPIOs. duty points to an array of duty cycles, the number of array elements depends on the number of used channels. From the documentation it is not obvious if this is only needed for initial settings, if this is also accessed after the pwm_init call (e.g. ownership of the array is transfered) and if is save to pass NULL here. One 3-tuple is needed for each PWM channel/GPIO pin. Ownership transfer is not documented. The maximum duty limit is an implementation artifact. To understand where this limitation is coming from, it is necessary how the the software PWM works. 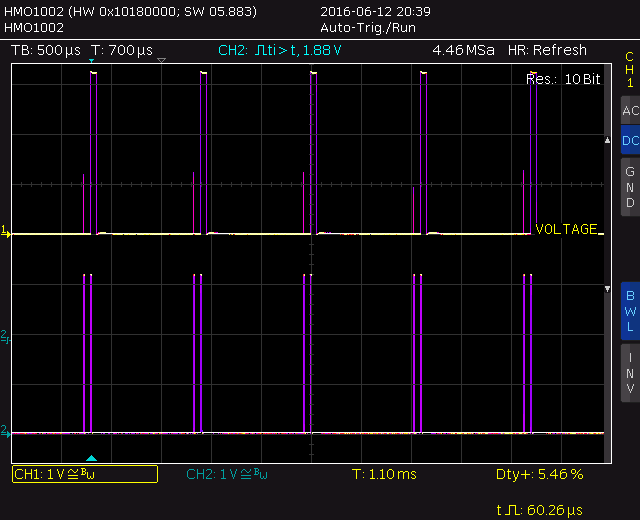 The following two scope traces both show the same signals, 2 PWM channels with a duty of 1467 (58.7μs) and 399 counts (15.9μs), with a specified period of 1000μs, but different timebases (500μs/div resp. 20μs/div). 1kHz PWM from Espressif SDK. A specified period of 1 milliseconds results in a period of 1.1 milliseconds. 1kHz PWM from Espressif SDK. Each Period is split into a „short pulse“ and a „long pulse“ phase. From the first trace one can also see that the long pulses run in parallel during the set period of 1000μs, but the short pulses are generated in a fixed size timeslot of 100μs sequentially, i.e. the actual period is 1100μs. Thus the maximum duty cycle is 1000μs (long pulse) + 5.32μs (short pulse) / 1100μs = 91.4%. 10kHz PWM from Espressif SDK. The PWM actually runs at 5kHz, as the right half is not accounted for. First thing I learned during the implementation is the quite high interrupt overhead of the NON-OS SDK (same may apply for the xtensa FreeRTOS port) . The interrupt handler which has to be provided to the SDK interrupt attach function is just a normal function (ABI wise), while the lowlevel interupt handler doing the housekeeping, like register saving and dispatching, is hidden somewhere in the ROM. This housekeeping adds about 2.5μs of overhead, which limits the maximum rate for doing timer based interrupts to about 3μs. So to get a resolution better than 3μs at least part of the GPIO pin toggling has to done with busy loops inbetween. While busy waiting is normally frowned upon, in this case is no worse than interrupts – either way the CPU is busy, either by spinning or by completing the interrupt handler. Another limiting factor is the access time of the ESP8266 peripheral registers. As others have noted, a write to these registers take about 6 CPU cycles, i.e. 75ns. The third point is the most important one, the one that needs some explanation. A software driven PWM typically enables all active channels at the beginning of the period (t=0) and then one after the other switches the channels off again, depending on the respective pulse width. polarity. This interpretation allows to remove any switching from the second half of the period, and in turn enables using this timeframe for a more fine granular pulse width generation. For the 4 channel PWM above, there are 5 phases. After the first three phases, the timer interrupt is set up for the delay, the last two phases are done with busy waiting inbetween. The heavy lifting is done in the setup routine called by pwm_start. It sorts channels by duty cycle, aligns PWM pulses to satisfy interrupt rate constraints (as done for channel 1 and 2 here) and transforms the absolut switching times to delays. Use a struct for related data. This allows the compiler to use relative load with a single base offset for multiple variables. Use a struct for the GPIO and timer registers. The SDK defines these as independent memory offsets, again combining these into a struct allows to use relative stores. Do not use the SDK GPIO manipulation macros. These insert a „memw“ (memory wait) instruction, costing two extra cycles (thats 25 precious nanoseconds out of 200 available). This article is about saving the world. At least, give our small green planet a chance to last until it is eaten by this red dwarf called sun. Motivated by an article and my recent purchase of a new laptop, I went looking for some reasons for the mismatch in power usage of KDE vs the other DEs. Although is was not worried about the differences in memory usage (others have commented on measuring memory usage correctly in depth), the increase of power usage between the beginning of the benchmark and the end struck me. As the system is idle in both cases, power usage should be the same, if not, there is something going on.